Description: This knife is a copy of the Solingen built "High Life" knives. The simple wedge shaped blade is etched with the familiar high life design, but the blade lacks a ricasso and has no maker's marks. 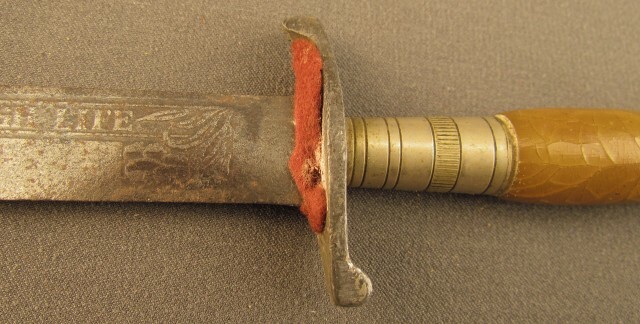 The crossguard appears to be nickel plated steel with a red felt blade washer. The grip is German silver with early yellow celluloid sections capped with a flower engraved brass finial and nut; the blade shows pitting under a dark patina. The celluloid grips show several cracks. An interesting knockoff, this knife will look great on display.